The first pilot plant in the world to demonstrate the technology of oxy-combustion - otherwise known as oxy-fuel firing - for carbon capture and storage is now in operation. The Schwarze Pumpe pilot plant, the result of Vattenfall's and Alstom's combined efforts in the development of carbon capture and storage (CCS) technologies, is the first pilot plant in the world to demonstrate the technology of oxy-combustion, otherwise known as oxy-fuel firing, for carbon capture and storage. Following an initial three-year testing programme, the plant is planned to run for at least 10 years. Built next to Vattenfall's existing lignite-fired 1600 MW Schwarze Pumpe power plant in Germany, the 30 MW pulverized coal demonstration plant, for which Alstom is supplying the oxy-boiler technology, contains all the necessary components to demonstrate the complete oxy-fuel chain, starting with oxygen production and ending with CO2 purification and compression. The erection of the plant and the commissioning of the boiler have been completed and an extensive test programme is to be launched on 9th September 2008 - the official inauguration date of the pilot plant. During the first test period, lignite will be the focus of the testing while bituminous coal will be used in a second test period. The tests will yield essential data on heat transfer, combustion efficiency, emissions, dynamic behaviour, plant design, performance, cost, and economics for both greenfield and retrofit applications. Through a co-operation agreement signed between Gaz de France and Vattenfall, the CO2 captured at Schwarze Pumpe will be used for enhanced gas recovery and storage at Europe's second largest onshore gas field, Altmark, during a three-year trial period. CO2 will be injected at depths of 3000m, and methods will be investigated for extending the natural lifetime of a gas field combined with permanent CO2 storage. The 30MW pilot plant will provide the technical basis for the construction of much larger 200 -300MW demonstration power plant to be constructed by 2015. Oxy-fuel firing represents one of several methods available to capture CO2 from power plants. Research and testing of oxy-fuel applications are being pursued by European and US suppliers in collaboration with utilities, academia, the US Department of Energy and the European Union. Based on economic studies of a range of CO2 mitigation technologies, oxy-fuel firing is competitive compared to other pre-combustion and post-combustion technologies. 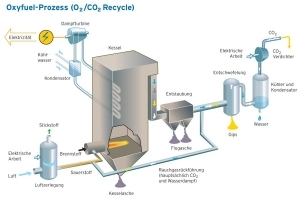 Oxy-fuel firing technology is a process in which fuel is burned in a mixture of high purity oxygen ([s40]95 per cent by volume) and recirculated flue gas, essentially eliminating the presence of atmospheric nitrogen in the flue gas. The resulting flue gas contains primarily CO2 and water vapour, along with small amounts of nitrogen, oxygen, and gases like SO2 and NOx. This resulting flue gas can be processed relatively easily (through rectification or distillation) to enrich the CO2 content in the product gas to more than 99 per cent purity. The CO2 can then be used for industrial applications such as enhanced oil or gas recovery (EOR or EGR). Alternatively, the flue gas can be dried and compressed for geologic storage, which results in near-zero gaseous emissions from the power plant. This technology is adaptable to the large fleet of existing PC and CFB power plants. 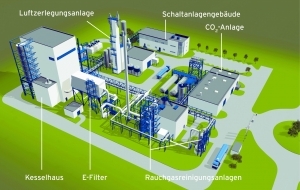 Economic evaluations show that purifying the flue gas from oxygen-fired systems can be competitive with extracting the CO2 from air-fired systems with advanced post combustion technologies and would cost less than today's commercial amine technologies. Central to commercial scale oxy-fuel firing technology is the ability to separate oxygen from atmospheric air. The oxygen may be supplied today by a cryogenic air separation unit (ASU), or in the future by more efficient processes such as oxygen transport membranes. A main challenge lies in the energy required to produce oxygen on a large scale with the current generation of ASUs. Today's cryogenic air separation plants typically require electrical inputs of up to ~18 per cent of the power plant's gross electrical output (~230 kWh/tonne of O2). However, these figures are extrapolated from ASUs currently operating in industrial applications. Future ASUs for large power plants will be much larger than any existing today; in fact, it's calculated that air separation units approximately four times larger will be required. Due to economies of scale, these ASUs will require proportionately lower electrical inputs. In addition, new technologies are being actively developed to separate oxygen from air using much less energy, which significantly improves the economics and thermal efficiency of oxy-fuel power production. Starting in 1998, Alstom initially completed several studies to investigate the technical and economic viability of the oxy-fuel firing concept compared to other CO2 mitigation technologies. The studies involved both PC and CFB combustion systems, and considered both greenfield and retrofit applications. Concept validation work also included bench scale and pilot scale testing. - Combustion and flame characteristics. These measurements for the combustion section and the gas treatment sections for oxygen and air-firing operation are set as validation targets. General operating experience will also be gained, including load changes and dynamic interaction between the different systems, in particular the recirculation system operation, the ASU system and the CO2 compression and purification systems. These results will serve as a basis for defining further equipment testing to provide the input for designing the commercial scale plant. - It uses proven, reliable, commercially available PC and CFB technology. - Oxygen can be readily produced by commercial cryogenic distillation air separation processes. Project economics are also expected to improve as the CO2 value chain is clarified and infrastructure is developed. For these reasons, the development of oxy-fuel firing is important to the electric power industry as an attractive option for carbon capture and sequestration. In order to achieve the reduction targets of the power sector, carbon capture and storage is vital. Every effort must be made by governments worldwide to ensure that long-term policies and market regulations are put in place early enough, both for equipment suppliers to plan the necessary production capacities and for the end users to plan power fleet adaptation.